I'm making Oriental Harmony by The Sweet Tea Girls. I know this is kind of flashy for a lap quilt, but I'm not too fond of wall hangings and the fabric is stunning. It finishes at about 42X62. I'm making the black one. I have plenty of fabric to make it bigger. Of course, I can't increase the size of the panel (24X44). It's fixed. 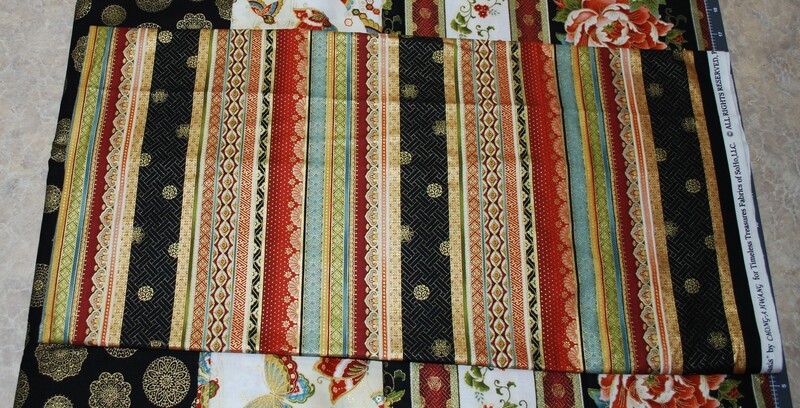 The only fabric I might be short on is the stripe that is used at the bottom and top of the panel and for the binding. 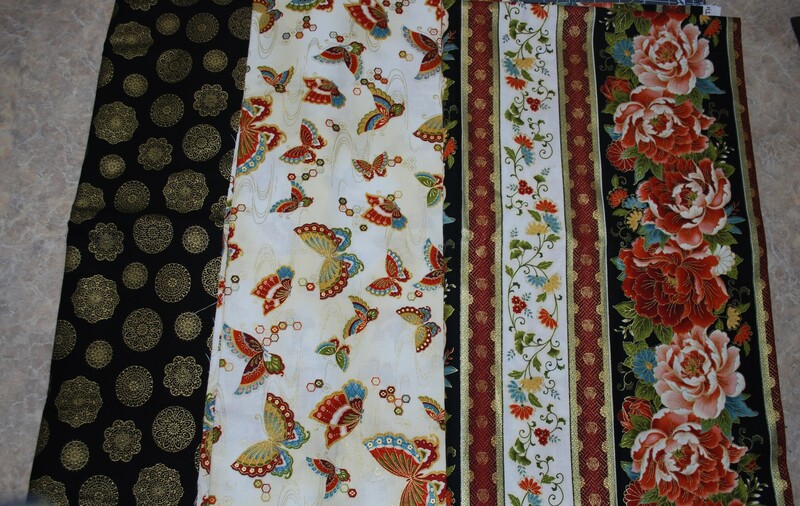 I also have a couple of yards of the black with the gold medallions that is used as the border on the panel if that is any inspiration. How would you increase the size? How much do you want to increase it? I'd do another row of the squares and L shapes (is that the border?) It would look fine without another striped row, too. Jordan fabric.com has a tute on slicings a panel from top to bottom into different sections. I can't remember what she called the technique but it's very attractive. The size quilt you are describing would look great as a throw quilt. Maybe just add a bit of borders if you aren't a small person. I have a throw quilt on my sofa to cover me up when I need a brief nap. It is literally thrown over my sofa and looks great. Tigger's comment made me think of a few panel quilts I've seen here that were made into Attic Windows. Maybe that would allow you to increase the size of the panel. Thanks for the suggestion of slicing, but I'd like to stick to the look of the pattern. I think it's perfect like it is and I hope I don't screw it up by increasing the size. The person I'm making it for is pretty heavy. She's not very tall, but 41" might not be wide enough to be a comfortable throw or lap quilt. I think I need to add somewhere in the ballpark of 7" to 10" total. I just measured myself and it would take 46" to cover my shoulders if I'm lying on my side. I guess I just don't trust my judgement. I often put something together and then don't like it. Then, I have to rip it out and change it. I guess I could make a quilt for my friend with some other fabric, but this fabric is unlikely to be used as a wall hanging. It's so pretty, it's a shame to let it wait for my estate sale. I would just repeat the pattern, making the L shapes longer or more squares of the print. Or reverse the Ls and squares for the second go round. And if you need a third set of Ls and squares do the same as the first. Hope this makes sense.